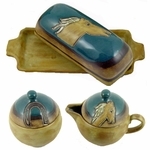 The links on this page will take you to Mara Stoneware Accessories of sugar & creamers and stoneware butter dishes that match some of Mara's uniquely designed Stoneware Dinnerware Sets. The Mara Stoneware Tumblers featured on this page make great drinking glasses for some of Mara's 16-piece Stoneware Dinnerware Sets. If you like unusual stoneware decanters, you have extraordinary design choices in this category. The Stoneware Tiles-Trivets features 6-inch and 8-inch stoneware tiles. The Stoneware Trivets make an excellent hot plate to protect your table when serving hot foods. You can even find Mara Stoneware Pet Bowls or Pet Dishes for your favorite dog or cat featured in the link below.